I already had the pleasure of attending one of Monk Bodhi Dharma’s breakfast degustations but couldn’t resist the invitation to another. Tresna of Foodhands had organised for a bunch of us to go but she herself could not make it. This meant that I didn’t know who my dining companions were going to be! It was actually pretty exciting. As usual, I underestimated time needed to navigate peak hour traffic and was late. When I arrived, @laramcpherson, a woman of countless talents, and @cakemistress, another lass of considerable culinary prowess were chatting like fast friends. It was such an honour to breakfast with such diverse ladies! 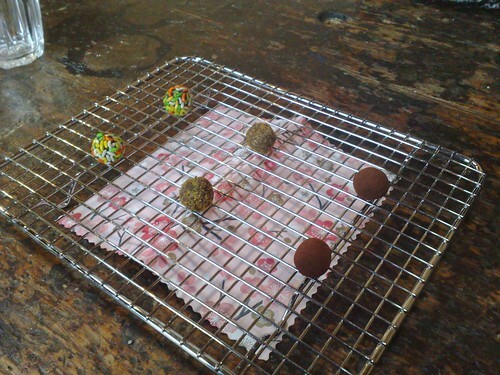 I don’t know how head chef Kate does it. The menu was so different to what I’d previously experienced here. 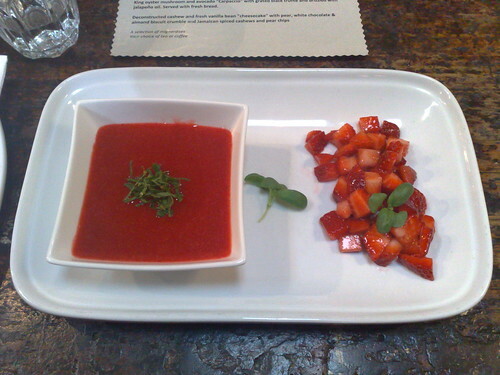 We were started with a Swedish style smultron lime soup and strawberry salad. If you want to kickstart your tastebuds and your metabolism, this is just the dish to do it! It’s zesty and invigorating. 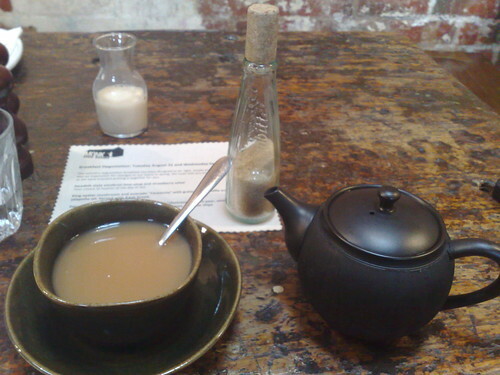 Although MBD is a fab place if you’re in need of an excellent coffee fix, it also takes tea very, very seriously. 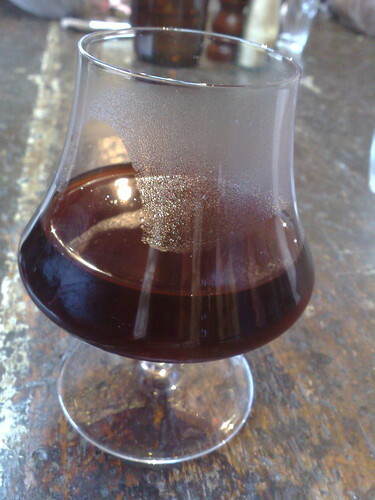 With your degustation, you get the choice of two drinks and I started with some tea – their Ceylon Greenfield Estate. I do have a fondness for the crockery used too: the slightly uneven handle-free cup that you clasp between your hands as you bring it to your lips. I plan to go back and slowly work my way through their extensive tea menu. There is something about a perfectly made cup of tea that feels like home. I get horribly grumpy when it’s too hot in Australian summer to drink a cup in the morning! The next dish had me quaking in my boots. I had completely forgotten to tell the staff that while not allergic to avocado, I can’t eat it because it seems to set off an existing tummy ailment. I decided I’d eat the dish anyway and incur the wrath (that is, crippling pain and swelling) later. Did I mention that this was served with beautiful bread? 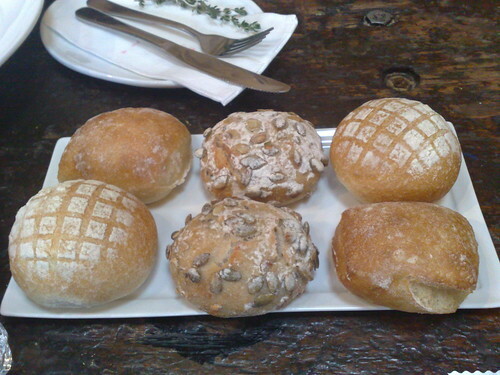 One type of the miniature loaves had pumpkin seeds, yum! Time for another beverage. This time I chose the Ethiopian Yirgacheffe as a pourover at Kate’s recommendation. Lucky me, it was the last one available. Alas, my palate isn’t refined enough to pick out the bubblegum characteristics it supposedly has. We’re not finished yet! 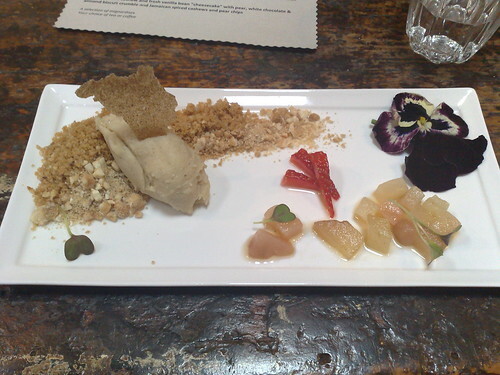 Last course was a deconstructed cashew and fresh vanilla bean ‘cheesecake’ with pear, white chocolate & almond biscuit crumble. This was finished off with Jamaican spiced cashews and pear chips. 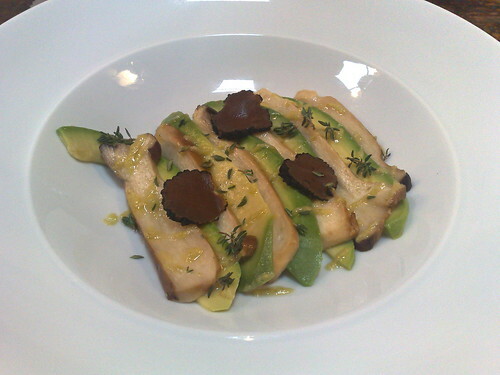 Normally, I hate on ‘deconstructed’ dishes something shocking. No hate here – I loved it and yes, it really was deconstructed as opposed to on my plate in several pieces. In my mind, ‘deconstructed’ doesn’t necessarily mean ‘in several pieces’ but rather ‘disassembled’. Again, I blame the arts degree. The texture and taste of the ‘cheesecake’ bit reminded me of the Indian sweet barfi. Alas, if you’re allergic to nuts, then this course is not suitable for you. Also, out of Lara & Em, I was the only one game enough to eat my pansy. Hey, I’m still alive. 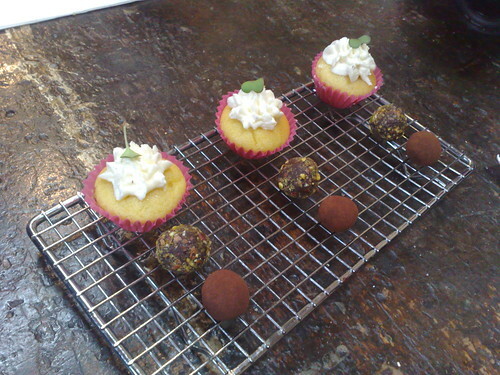 Not content to spoil us with three extremely inventive and mouthwatering courses, we were sent on our merry way with a parting trio of vanilla bean miniature cupcakes, rosewater pistachio truffles and Vanuatu chocolate truffles. Even the inner (and generally well-hidden) girlie girl in me squeed at the sight of the cupcakes. Just like the first one, all this will set you back $30 and if requested, you can have everything vegan-friendly. I was on such a high from scrumptious food and wonderful company for the whole day. Breakfast really does set you up for the rest of the day! Monk Bodhi Dharma has just started doing dinners too. I’m planning to have dinner there one day before the monthly Ale Stars session (they’re both very close to each other) – can’t wait. This entry was posted in coffee hipstery, eatie-foodies dining out and tagged Balaclava, coffee house, degustation, Monk Bodhi Dharma, St Kilda East, vegetarian restaurants on October 12, 2010 by gem. breakfast degustation, why aren’t more places doing it! While we hadn’t officially met, Tresna and I had been conversing on Twitter and I’d found out through her updates that a place was offering a breakfast degustation. Doesn’t that sound like the best thing ever?! Breakfast that just stretches for courses and courses…mmm yes. So myself, Tresna and Ceri from Healthy Party Girl blog found ourselves at Monk Bodhi Dharma in Balaclava, just across the road from my beloved Local Taphouse. For $30 we would be served four courses with our choice of tea or coffee. It turned out that Tresna and Ceri had met at the Eat Drink Blog inaugural conference and were chatting like old friends when I arrived late. I am so out of sync when it comes to travelling in peak hour traffic by car, whoops. The first course had just arrived when I did – an Algerian citrus cleanser paired with a Tunisian apple and celery salad. 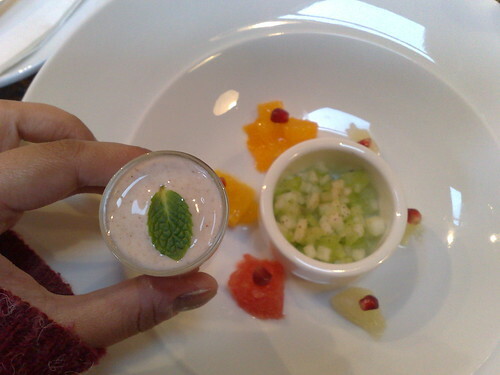 Close up, a shot glass of berry yoghurt with a miniature mint leaf. Various citrus fruits (mandarin, grapefruit, lemon) were used and then topped with a pomegranate seed. A very invigorating and healthy start to the North African themed breakfast. With our appetites very much whetted, we were greeted with a more substantial course next – a Moroccan mushroom harvest on flatbread with sumac goats’ cheese. As a largely happy omnivore, I don’t want to say that this dish was just like eating meat, but when I do say that, I mean that there are indeed vegetarian-only flavours that are highly pleasing to the omnivore palate. 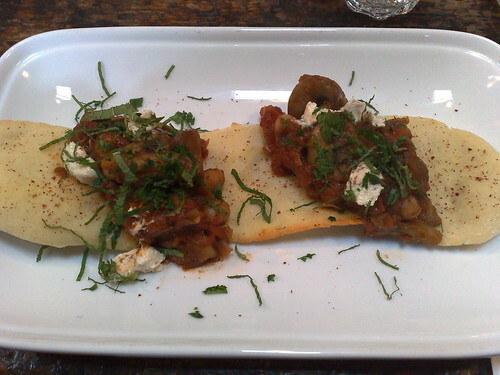 Mushrooms, for example are definitely up there, as are chickpeas which this dish also had. Lovely! Time for some coffee! 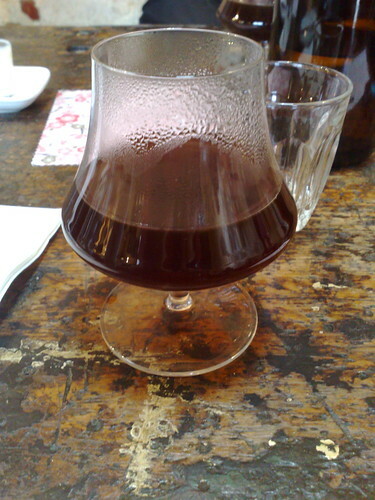 We all chose the syphon of the day, an Ethiopian Yirgacheffe. A very subtle-flavoured coffee with touches of floral and maybe even some citrus notes? I’m just going on what I could taste as my coffee knowledge is sorely lacking. I drink more tea than I do coffee and found this well suited to me. I don’t really like my coffee to kick me in the nuts first thing in the morning! 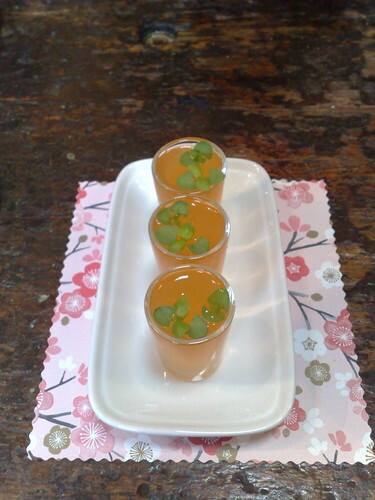 Before the next savoury course, we were given a tomato soup cleanser with miniature basil and advised to drink up our coffee before trying it. Gosh, this was so good – how can something so healthy taste so glorious! There were suggestions that it could be ‘spiced up’ with some vodka…ooh yes. An excellent pick-me-up. The spoils still haven’t stopped! 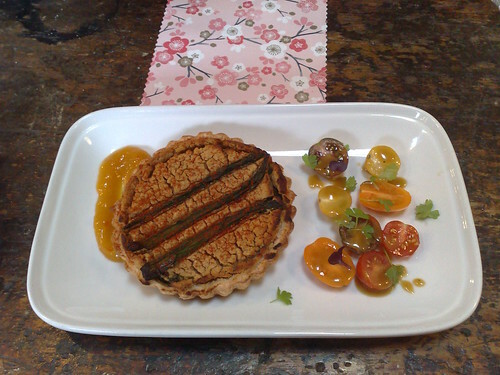 Our last savoury course was a butterbean and baby asparagus tart with heirloom tomato salad and pomegranate lime dressing. The tart was creamy in texture and a great match to the acidity and sweetness of the mango chutney. The tomatoes were heavenly – sometimes vegetables with simple dressings are the best. At least, those are the sorts of salads I tend to prefer. Just one last course! 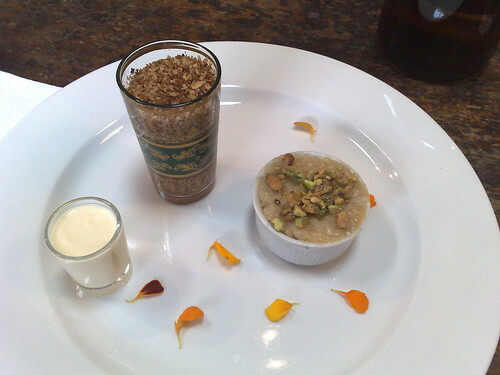 A North African orange blossom rice pudding with an apple crumble in a beautiful tumbler. At first the rice pudding seemed a little stodgy, but duh me, that is what the shot glass of cream is for! Add that, stir and enjoy the dreamy texture. Don’t be afraid to mix, folks! The lovely barista chose a pourover for me as I couldn’t decide what coffee to have next – he gave me a full-bodied Kenyan (I confess the name wasn’t obvious to me…sorry about that!). This was very much the opposite to the Yirgacheffe we all started with – robust, rich and thicker. Tresna sadly had to leave and missed out on Ceri and I nomming some truffles which brought our decadent breakfast degustation to a close. From right to left, you have your standard chocolate, in the middle is pistachio and the colourful one is candied fennel. How wonderfully unusual does that sound? 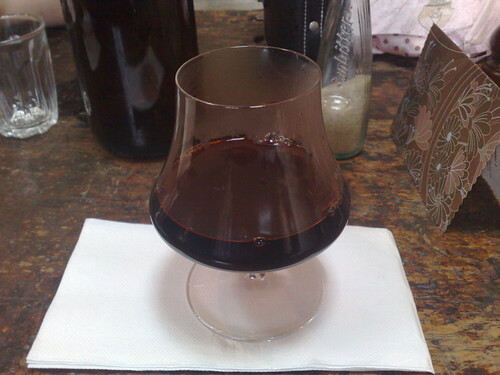 It reminded me very much of anise or liquorice (which I happen to love, though I know a lot of people don’t). Some fantastic food on offer here for the breakfast degustation and keen for a repeat visit. If you are interested in trying the degustation, do note that you should allow an hour and a half (though they can start at 7.30am) and it’s only offered on Thursdays and Fridays. If you’re vegan, not to worry – dairy substitutes are available (Ceri in fact requested vegan substitutes). Be warned, you might not have space for lunch later in the day! 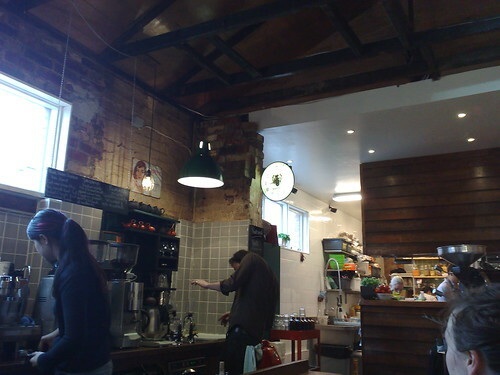 You can also read Ceri’s account of the breakfast at her blog. I’m sure all three of us can attest that it was worth getting up early for – this coming from the worst morning person ever. This entry was posted in coffee hipstery, eatie-foodies dining out and tagged Balaclava, coffee house, degustation, Monk Bodhi Dharma, North African cuisine, St Kilda East, vegan restaurants, vegetarian restaurants on July 21, 2010 by gem.